[Paul Allen] has been working on the latest iteration of his NiMh battery charger and it looks amazing! We’ve covered [Paul Allen]s awesome hacks and tutorials before, but never this project. What makes his charger so special is it’s ability to monitor and log every aspect of the charging process. Not only does it have a SD card for data logging, but it also interfaces with a Windows application for real-time monitoring as well as analysis and visualization of the charging process (Linux users don’t fret it has a serial interface too). [Paul] doesn’t say if he plans to open hardware or kickstart the charger, but some of his older posts give us a quick peak at the gerbers. Let’s hope this awesome project makes its way into the wild soon, and hopefully we’ll be able to try it for ourselves and see if it lives up to its name. With grand plans of tenting out for several days at a music festival [Josh] needed a way recharge his portable devices. In the past he’s lugged around a 12V battery with him, but this year he wanted to make things easier. 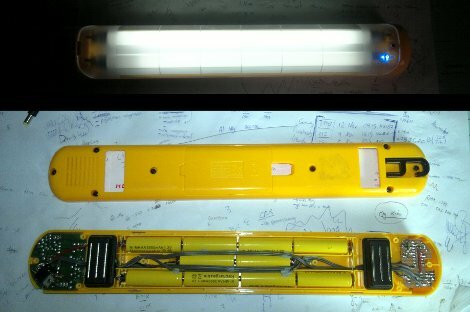 He ended retrofitting a camping light to do the job with the help of the summer sun. The first step of the project was to source some rechargeable batteries. He toyed with the idea of Li-Ion cells but ended up going with NiMH because the charging is more forgiving and he got them at a great price. Because of the lower operating voltage (1.2V versus Alkaline’s 1.5V) he needed to squeeze two more into the lamp housing. Here you can see that he just managed to get them to fit in the wire-run area down the middle of the case. Next comes the recharging circuit. He based his design around an ATmega44, using a voltage divider and the ADC to detect when the batteries are topped off. During the day this is connected to an external solar panel and it’s ready to charge his phone when he gets back at night. Looking at the size of this bristlebot the first thing we wondered is where’s the battery? All we know is that it’s a rechargeable NiMH and it must be hiding under that tiny circuit board. But [Naghi Sotoudeh] didn’t just build a mindless device that jiggles its way across a table. This vibrating robot is controllable with an infrared remote control. It uses an ATtiny45 microcontroller to monitor an IR receiver for user input. An RC5 compatible television remote control lets you send commands, driving the tiny form factor in more ways than we thought possible. 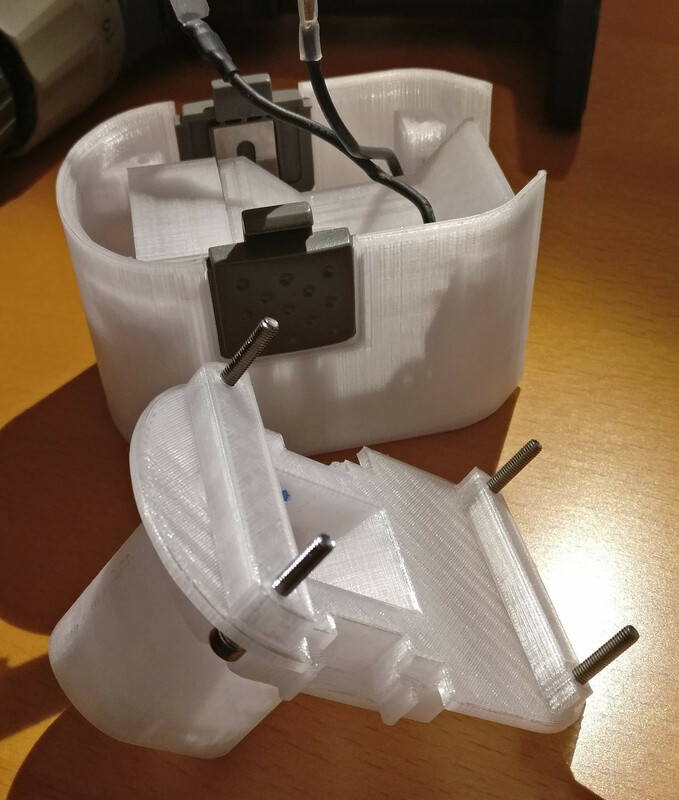 Check out the video after the break to see how well the two vibrating motors work at propelling the device. They’re driven using a PWM signal with makes for better control, but it doesn’t look like there’s any protection circuitry which raises concern for the longevity of the uC. This build was featured in a larger post over at Hizook which details the history of vibrating robots. It’s not technically a bristlebot since it doesn’t ride on top of a brush, but the concept is the same. You could give your miniature fabrication skills a try in order to replicate this, or you can build a much larger version that is also steerable. Living in a brushfire-prone area, [Erich] had a set of roller shutters installed to protect his home. Mains power can be spotty in emergencies, so the shutters are powered by NiMH batteries which are housed inside the shutters’ remote control units. 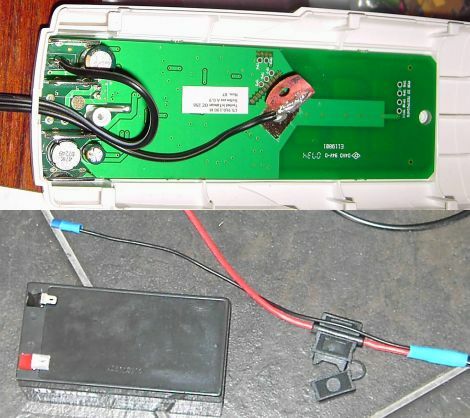 After encountering a good handful of dead batteries, he decided it was time to search around for a better means of powering the shutters rather than pay another $80 AUD for batteries that he knew would fail in short order. After disassembling the shutters and the remotes, he found a litany of problems. The remotes are ATMega-based, so he assumed the programming was robust, but he found that the charging algorithm was quite poorly implemented. The batteries were allowed to get extremely hot while charging, a result of the fact that charging was done for a set period of time rather than monitoring battery voltage. Additionally, the shutter motors required a 4 amp instantaneous current when activated, something that seemed to contribute to the quick draining of the 1500 mAH battery packs. To remedy his issues, he upgraded to a much larger sealed lead acid battery pack, which he mounted in a wall cavity. The remotes were tweaked to add a modular power plug, enabling him to easily connect and disconnect the remotes as needed. Not only did he save a ton of money on constantly replacing batteries, he’s got a nice 12v power supply in the wall that he can tap into at will.